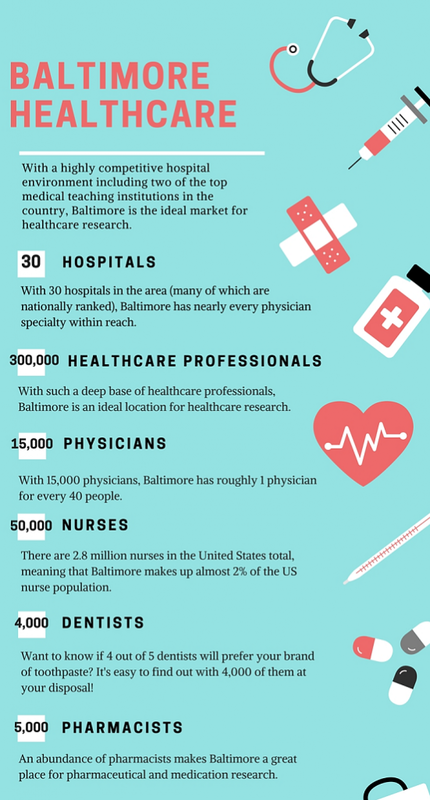 With a highly competitive hospital environment including two of the top medical teaching institutions in the country, Baltimore is one of the most sought after markets for healthcare research. Johns Hopkins and the University of Maryland are two of 30 area hospitals that provide employment for upwards of 300,000 people in the state of Maryland, including 15,000 physicians, 50,000 nurses, 4,000 dentists, and 5,000 pharmacists. With healthcare costs on the rise, many families, seniors, and disabled individuals need to opt out of healthcare programs simply because they cannot afford them. As over 109 million Americans suffer from chronic diseases like cancer, obesity, and heart disease, personalized medicine and healthcare programs are becoming the most successful healthcare brands. These brands need market research in order to be successful in an evolving environment. If you are able to obtain the right insight from consumers and medical professionals, you’ll be able to market your healthcare products and services effectively and profitably. If you know your target audience, you’ll be able to create platforms that they will pay attention to and understand. This entry was posted on Wednesday, September 16th, 2015 at 1:31 pm. Both comments and pings are currently closed.